Enjoy Free Delivery and a 5 year guarantee on this Television. Purchase by the 12th June 2014 and claim a free LG G Tablet. Click the banner above to make your claim and view full terms & conditions. The LG 55" ULTRA HD LA970W TV represents the next level of picture quality and clarity, boasting a resolution four times higher than Full HD. Incredibly sharp and crisp, even when viewed from close distances. I've just been informed by LG that there will be NO upgrade paths for anyone from the current HDMI 1.4 to HDMI 2.0. Unlike Toshiba or Sony who are offering all early adopters FREE firmware upgrades, Samsung who are also offering a hardware solution (more than likely at a cost). "I'll have one for the bedroom and one for the kitchen"
"Get John Lewis to price match"
"I got this for 50p on a misprice"
and "I'm waiting for these to drop to £999"
Even though decent 1080p sets at 55 inches still retail for well over a grand! In before the:"No 4k content""Buy 1080p""Won't work with netflix""too … In before the:"No 4k content""Buy 1080p""Won't work with netflix""too big""too small""LG are crap""not an iphone""I'll have one for the bedroom and one for the kitchen""rather have a Sony""How's plex on this? ""Get John Lewis to price match""I got this for 50p on a misprice"
Think you covered all the excuses possible. So hopefully won't have more of them. Hot from me. Well, that should put 1080p 55" at ease ( read: below 1k mark - I mean decent 55" ). HOT - best price for 4k 55" around. "Ultra HD = 4" ?? I'm not sure where your sums come from but 4K is a shortened abbreviation of 4K2K which itself is an abbreviation of 4000x2000, which the industry decided thats what they'd call the resolution rather that 3.8K2.2K. So actually the 4 = 3820 (horizontal pixel resolution). But if you were looking to buy a new TV anyway and had a choice between this or a 1080p set for a few hundred quid less you'd do better to get this, then you won't want/need an upgrade when there is lots of 4k content available. I'll probably be mocked for saying this (esp with the first post above), but I really did get this for £49.99 on a misprice so COLD from me! Was gutted seeing this price! - Paid 1400 for a 55" 1080p set this time last year - BUT my mind is at ease knowing that 4K/UHD has no decent standards yet for delivery so its all overkill anyhoo. Would love a new TV but our 46" panny is still going strong they seem to last forever. I'll give you one very good reason! It's so that people like you can buy your 4K TV 5 years from now for peanuts. If everyone thought like you such that there were no early adopters for a new technology, they would never take off and would not make it into mainstream. This would mean that in a year's time there would be no 4K TVs for you to buy full stop. So, I urge you to reconsider your stance. normally around 1999. great deal. No way investing in 4k tvs when there still suffering from banding. Would have thought by now they would have sorted this problem out. Ultra HD is the consumer standard resolution and is 1080p x 2(found on TV's, monitors etc.) 4K is 4096 x 2160 and is the standard used in the film industry, when cinemas move from full HD, this is the resolution they will use. I'll probably be mocked for saying this (esp with the first post above), … I'll probably be mocked for saying this (esp with the first post above), but I really did get this for £49.99 on a misprice so COLD from me! Nobody else can get your misprice though can they? Why are you even bothering to rate/post about that, just be happy with your blatant lie. No company would ever sell you a £1600 product for £50 just because its priced wrongly. They legally don't have to sell you it at all! So I should buy this on the basis of being a guinea pig for LG? Like I say, it is purely because of the total lack of 4K content and it makes no sense for me personally to upgrade to UHD. This set doesn't even have HDMI 2.0 which in my opinion is absolutely essential for all UHDTVs. It frustrates me that manufacturers go all out to advertise their new high resolution sets with no content? If more effort was made into making content available before release then perhaps. I'm sure a number of consumers are being misled here as they may think they can watch their Sky in UHD but this just an upscaled 1080i/720p picture. If you want to go ahead and be a guinea pig then be my guest. So I should buy this on the basis of being a guinea pig for LG? Like I … So I should buy this on the basis of being a guinea pig for LG? Like I say, it is purely because of the total lack of 4K content and it makes no sense for me personally to upgrade to UHD. This set doesn't even have HDMI 2.0 which in my opinion is absolutely essential for all UHDTVs. It frustrates me that manufacturers go all out to advertise their new high resolution sets with no content? If more effort was made into making content available before release then perhaps. I'm sure a number of consumers are being misled here as they may think they can watch their Sky in UHD but this just an upscaled 1080i/720p picture. If you want to go ahead and be a guinea pig then be my guest. I would say depends how long you are gonna use it and what are you going for. I personally use tv for up to 10-12 years until it's broken. by that time, im pretty sure 4k content will be popular. You missed "hasn't got HDMI 2.0"
Can anyone see how many HDMI inputs it has and what the response rate is? I am tempted by this as my 6 yo Samsung is looking very dated....Can … I am tempted by this as my 6 yo Samsung is looking very dated....Can anyone see how many HDMI inputs it has and what the response rate is? LG TVs have struggled with input lag recently, which suggests that there is quite a bit of processing going on behind the scenes. However in our recent review of the LA860 we measured a lag of about 50ms which whilst too slow for dedicated gamers was at least an improvement on last year. Sadly the LA970 is a retrograde step, measuring a decidedly tardy 109ms even in Game mode. This will undoubtedly be too slow not only for the more expert gamer but also those of a less fanatical nature, so if input lag, or rather the lack of it, is important to you then the LA970 is probably not the best choice. LG TVs have struggled with input lag recently, which suggests that there … LG TVs have struggled with input lag recently, which suggests that there is quite a bit of processing going on behind the scenes. However in our recent review of the LA860 we measured a lag of about 50ms which whilst too slow for dedicated gamers was at least an improvement on last year. Sadly the LA970 is a retrograde step, measuring a decidedly tardy 109ms even in Game mode. This will undoubtedly be too slow not only for the more expert gamer but also those of a less fanatical nature, so if input lag, or rather the lack of it, is important to you then the LA970 is probably not the best choice. The LA970 packs an awful lot into a slim and attractive chassis, although for good reasons it’s a little deeper than some of the competition. There is a minimalist feel to the design, with a thin black bezel that measures 1cm and surrounds the entire screen. At the top is a pop-up camera and microphone for making video calls and facial recognition, whilst at the bottom is the logo and a power indicator light. At the far right rear of the screen there are some basic controls, whilst at the rear left are the connections. There are only three sideways facing HDMI inputs, although they include support for ARC and MHL. There are breakout cables for legacy connections, a CI slot and three USB ports. There’s also an Ethernet port, although the LA970 has built-in WiFi. 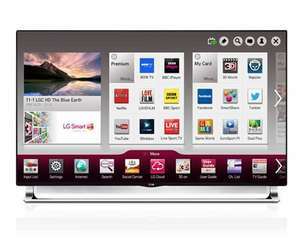 Quite how LG will address the issue of changing UHD standards and new versions of HDMI remains to be seen. The LA970 packs an awful lot into a slim and attractive chassis, although … The LA970 packs an awful lot into a slim and attractive chassis, although for good reasons it’s a little deeper than some of the competition. There is a minimalist feel to the design, with a thin black bezel that measures 1cm and surrounds the entire screen. At the top is a pop-up camera and microphone for making video calls and facial recognition, whilst at the bottom is the logo and a power indicator light. At the far right rear of the screen there are some basic controls, whilst at the rear left are the connections. There are only three sideways facing HDMI inputs, although they include support for ARC and MHL. There are breakout cables for legacy connections, a CI slot and three USB ports. There’s also an Ethernet port, although the LA970 has built-in WiFi. Quite how LG will address the issue of changing UHD standards and new versions of HDMI remains to be seen. 109ms in GameMode?? I'll definitely be giving this a miss. Cheers. I'm sticking with my 1080p Panasonic VT65 Plasma until 4K has been standardised. Thanks :)109ms in GameMode?? I'll definitely be giving this a miss. … Thanks :)109ms in GameMode?? I'll definitely be giving this a miss. Cheers.